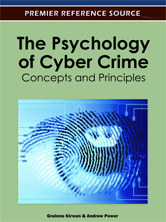 The Psychology of Cyber Crime: Concepts and Principles aims to be the leading reference examining the psychology of cybercrime. This book considers many aspects of cybercrime, including research on offenders, legal issues, the impact of cybercrime on victims, punishment, and preventative measures. It is designed as a source for researchers and practitioners in the disciplines of criminology, cyberpsychology and forensic psychology, though it is also likely to be of significant interest to many students of information technology and other related disciplines.